I was on a westbound train out of Minneapolis, heading for for Portland, when I had one of the more remarkable experiences this journey has provided. 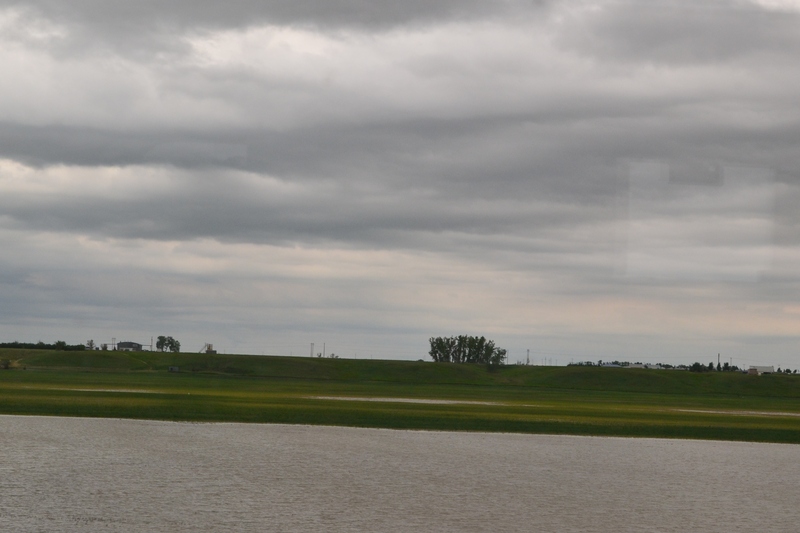 It was mid-June and the Empire Builder route had been out of service for a week due to heavy rains. The night I left Minneapolis was the first run west this train had made since the immediate flooding had gone down enough to allow safe passage. But by morning the train was already behind schedule. In the early morning I went and found myself a seat in the observation car. A pleasant looking man in his forties asked if he could have the next seat. He hailed from Louisville Kentucky where he owned a successful company. His two tween aged kids were with him and there were frequent calls and texts back to Mom, who was enjoying some “me” time. He and the kids were going to explore the Glacier Park in Montana. As the train moved slowly from Minnesota into North Dakota we chatted with the train’s barman, stationed right next to us. When politics entered the conversation I soon realized that my companion was a very suave well educated member of the tea party. I said nothing about my own political affiliations and just listened. While the rest of the country labors under this, the fourth year of the 21st century depression, North Dakota is in the middle of an oil and gas boom. Wizened farmers are taking their newly gained wealth and leaving for Hawaii. Any able bodied man tough enough to be a rigger can get a job that pays enough to support a family. Women are welcome to apply to sling hash. In the spring of 2011 record breaking snowfall became record breaking flooding. In Minot ND, a rigger heading home to Montana boarded and joined our small party in the observation deck. Minot is the same town that suffered a devastating flood just days after I passed through. The train had slowed to a crawl, with frequent complete stops as conditions changed on the tracks. We were supposed to reach the Glacier Park at sunset, but now the estimated time of arrival there was just before dawn. Food was running out on the train as well. We were promised that they would take on a delivery of fried chicken somewhere down the line. At some little whistle stop the border patrol boarded the train for a citizenship check. Each passenger was asked their citizenship. Most were not asked to prove it. There was a contingent of German’s on board, all with proper passports. When they reached our group, Mr. Montana told them they should ask Obama the same thing. Then something odd happened. I had been mostly silent the whole way. Mr. Louisville was a good conversationalist except for the political thing, and the evening had passed quickly enough. But I was getting hungry. And I was arguing with myself about whether to spend some of my last precious dollars on food. Just as the fried chicken was delivered the Kentucky group said good night and departed for their sleeping car. I would be sleeping in my seat on the observation deck. That is when the man from Montana offered to buy me a chicken dinner. I accepted. We munched on our chicken and talked in the fading light. He talked about his family and life in the big sky country before things got so hard. He also asked me about myself, whether I was married, had kids etc. When I said no, and told him I was widowed he offered sincere condolences. We spoke of how hard it was to raise kids now, to know they were safe. In short he became human to me. I began to realize that this person and his fellows were not my enemy. I may find him ignorant. His birther comments may offend me. His anger may scare me. But he is one of the people being most affected by the wickedness of the free market and the excesses of Wall Street. It is the job of the progressive left to show people such as this who the real criminals are. If we are not making our case with the words we are using now, we need to find new words. It is very important to know who the real enemy is, and not allow the angry words of a poor family man distract me from the real villain in this story—the elite rulers who crashed our economy for profit’s sake.